Your time can be as solitary or social, as active or relaxed as you’d like. There is nothing you have to do and a great deal you can do. Spend the afternoon golfing or playing tennis. Cozy up to the fire with a book, retreat to the spa, water ski in the summer and slide through the snow on a toboggan in the winter. A wealth of activities and diversions await you on the lake and in the mountains. Rambling terraces, screened porches, misty mountain mornings and cozy fireplaces. The simplicity of it all takes you back to a time when gentility ruled and a Savannah heiress named Lucy Armstrong Moltz called this historic property home. 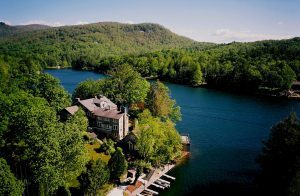 The Restaurant at the Greystone Inn is committed to reducing our environmental impact and increasing our use of sustainable resources, while providing the finest and freshest foods for our guests.Our panoramic dining room with windows that frame the glittering lake is open to hotel guests and visitors alike. The seasonal menu is be inspired by the surrounding forests and mountains, lakes and streams as well as the international travels of New Zealand born Chef Regan Browell.